Have you touched your paint-brushes since years? If not, then Paintology’s Paint-party is the perfect way to get back to your long-lost hobby or to indulge in painting for fun! To come to our painting-party, you do not need any painting experience as we guide you from the scratch at each and every step to finish a painting! Don’t worry, you don’t need any drawing skills as we do that for you! Paintology is known to indulge people into painting for fun , and to de-stress one’s mind and soul, for which you don’t need to know painting! Yes!! ABSOULTELY, NO PAINTING EXPERIENCE IS NEEDED! 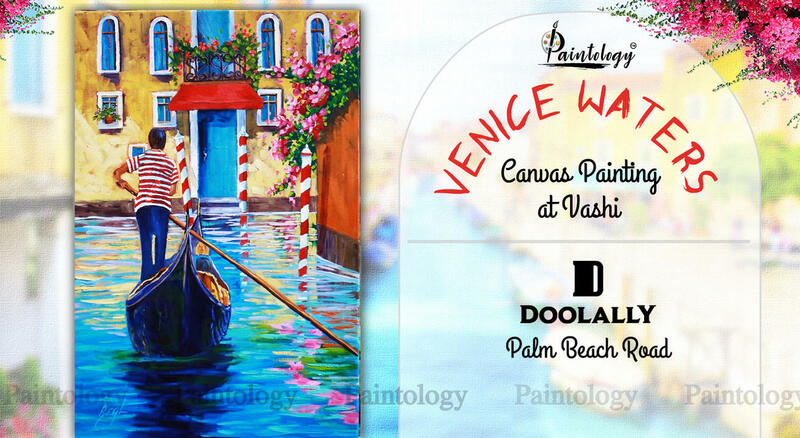 Paint this beautiful Venice themed Canvas painting, taking you through a stroll of the city! all the various painting techniques and fun loving methods. These paint-parties are casual get-togethers where one does not need to be an artist to attend this event, so don’t wait and grab on your seat! We believe that ‘ART is THERAPY’ and will help one de-stress and feel the love for art with us. Includes all the painting materials + complimentary starters and mocktail.